In a previous blog post, the two most popular website platforms for creative entrepreneurs were compared. Second to the Wordpress or Squarespace debate is WiX vs Squarespace. WiX is another contender for best website builder. You’ve probably discovered this on your journey to find the right platform for your website. If you read my other post, Squarespace vs. WordPress, you might have gathered that I like to test out web design tools. WiX is no exception. I dug deep into WiX and learned all about its features and its benefits. I made lovely sites and became a Certified WiX Webmaster through the company’s own training program. After getting to know both WiX and Squarespace quite well, I have a pretty good idea about the pluses and minuses of both, especially for creative entrepreneurs. If you’re wondering which one is best for you, you’re in the right place. I have a lot to share. Pour some tea and let’s get started! WiX is a cloud-based, drag and drop website builder. Like Squarespace, they offer everything you need under one roof - domains, templates, and hosting. They use the “Freemium” model, so it’s possible to have a website for free. Free websites come with lots of ads for WiX and in places that compete with your own branding. 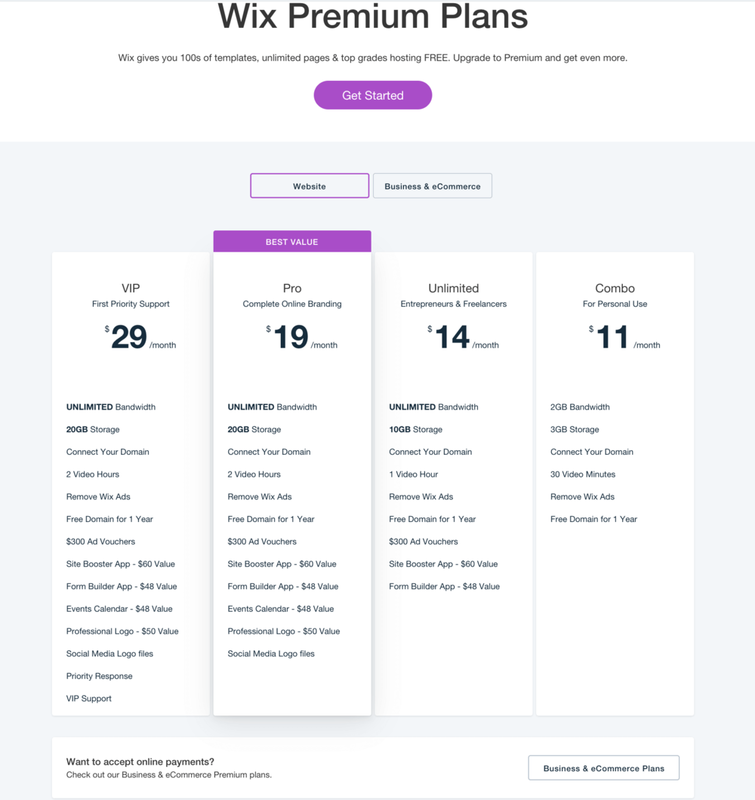 Upgrading your site to a premium package will remove ads and allow you to connect your own domain. Depending upon which plan you choose more bells and whistles will be available. See the image below for their pricing plans and what is included. Wix is a fun, relatively easy website builder and hosting service all-in-one. WiX feels like a blend of both WordPress and Squarespace. It’s potentially a happy medium between the two. Much of what makes both WordPress and Squarespace great has been combined. Like WordPress, users can expand the capabilities of their WiX site through apps and plugins found on the WiX’s marketplace. Some of these apps and plugins are created as well as maintained by the company. Others are created and offered by 3rd parties. The 3rd party apps and plugins integrate with WiX just fine. This can be a problem with WordPress as not all plugins available play nice with each other. A drawback to the use of apps and plugins is the cost associated. The premium apps - those without ads and increased functionality - come with a price above and beyond the service level fees for using WiX. The price of having a site on WiX can add up pretty quickly, depending on your needs. WiX offers hundreds of templates. Their catalog is added too often as well. If a template is not what you’re looking for, WiX offers a blank slate - a template you can completely make your own. With WordPress, one needs to have some design and development skills to customize a template. With Squarespace, there are a limited number of templates to choose from. WiX solved both problems with their large offering of templates and their blank canvas template. Since no technical skills are required, it’s easier to get the site you want. The downside to this? WiX is not mobile responsive. Currently, we are in a mobile-first world where at least 50% of the time websites are viewed on mobile devices. Mobile friendly and mobile responsive are not the same thing. All of Squarespace’s templates are mobile responsive meaning, regardless of the screen your website is viewed on it will look and function great. This is not the case with WiX. Unfortunately, you’re risking the appearance and overall user-friendliness of your site due to the fact that WiX websites are not mobile responsive. One other drawback to the templates is the load time. Most people do not like waiting around for a site to load. WiX sites, with all the add-ons and moving parts, can take some time to load. If you choose the lowest paid plan, you will not have unlimited bandwidth, so depending upon how many people visit your site in a month, your site may not load at all. Should you decide to go with WiX, make sure you select a plan with unlimited bandwidth. Again, WiX viewed their competition. One of the myths about Squarespace is poor SEO. And it is a myth. WordPress is known for having great SEO. WiX aims to compete with WordPress here. SEO - Search Engine Optimization is basically how sites like Google and Bing help you get found online. For many, SEO is a foreign language, and possibly even a very dry, boring foreign language we don’t want to learn, lol! WiX understands this and makes it relatively easy to ensure that the site you have created will get indexed by search engines like Google. The tout having the best SEO. The cool thing is that WiX really does make SEO easy and simple to understand. This is great because SEO can get rather complicated and overwhelming. While they do make it easy, this feature of WiX is not exactly proprietary. Users of WordPress can simply add Yoast to their site. Squarespace users and designers like myself know how to apply SEO tweaks to the platform to ensure that your website will get found online. If you need help, WiX offers support forums, knowledge base, email and phone support. This is for the premium levels only. For all levels there are support forums and knowledge base. The knowledge base is well organized. Answers to questions are pretty easy to find and advice can be easily implemented. I’ve learned though that if something is missing from the knowledge base then it is likely to be unavailable or not possible with WiX. For example, I went searching for how to schedule a blog post on WiX. I discovered this wasn’t possible. WiX also has a few active groups on Facebook in case you get stuck. All around, the customer support is almost on par with Squarespace. WiX has some great features and benefits. The backend - the guts of your website - is pretty easy to navigate. WiX refers to their backend as the editor. WiX could serve a creative entrepreneur well. You can set-up shop, clients can book appointments, and you can post calendars of your events, to name a few things you can do. The downside is that most of these functions cost additional money. Unlike Squarespace, these features are not included. In addition to cost, there is the software to install and configure. Now you have a time as well as financial investment, which is not something we creatives always have a surplus of. If blogging is important to you, and for most of us it is, WiX drops the ball. WiX has a long way to go with their blogging features and functionality. While WiX offers its SEO Wiz to help you get found online, the efforts end there. Content marketing and the promotion of your site through content is really important. Unfortunately, WiX does not have the tools to support this. If you are a content creator, WiX is not for you. With WiX, you might find that there’s always something missing. Even after you’ve paid for upgrades, it still isn’t quite there yet. WiX might be better as a hobby site than the home for your business. WiX just doesn’t function as well as Squarespace or WordPress. Like WiX, Squarespace is a website builder and an all in one service. You can purchase a domain name, build your website, and host it with Squarespace. You can also add your own professional email - highly recommended - through Google to your Squarespace site with ease. In the earliest versions of Squarespace, blogs and portfolio sites where the brand’s main focus. Thanks to the success of one template in particular, Squarespace has grown and they now offer a full suite of features and benefits to creative entreprenuers. Beautifully displaying work, products, and services as well as content has been at the heart of Squarespace. Squarespace offers over 60 mobile responsive templates. No matter what template you select it will look good on any size screen or device. Squarespace will sort these templates for you based on the intended use or goal of your site. Squarespace is often the choice for creative entrepreneurs. Squarespace does not offer a free level of service. Instead, Squarespace has a 14-day free trial. If you work with a Squarespace Circle member like myself, you can get a 6-month trial. Just sign up for a free account, select a template, and get to work on your Squarespace site, for free. Like WiX, Squarespace offers tiered levels of service, but theirs are more streamlined and inclusive. The backend, or the guts of your site, is well organized and very clear. Making design edits and tweaks to the appearance of your site is easy in the Design section. Adding pages and sections to your site can be found under the aptly named Pages. Navigation behind the scenes of your Squarespace site is very simple. If you do not like the template you’ve selected at first, you can change it, at any time. Unlike a site created on WiX you are not stuck with one template. This is great if your site needs change, or you need different features and functionality that one template has over another choice. Several templates, like the Brine template family is super flexible. A template selected from the Brine family has the capabilities of growing with you and your business, so depending on which template you choose, you may not have to select another one in the future. Real people are available 24/7 to answer your questions and point you in the right direction if you get lost. Support is available via email and live chat. There are also quick video tutorials to help you out and an active, friendly Facebook group. Instead of offering plugins and apps that can add up in both money and time, Squarespace simply incorporated helpful software so you don’t have to think or worry about it. As mentioned above in this post, Squarespace has partnered with other reliable companies to offer integrations. Squarespace will take the guesswork out of which service level is right for you. You won’t have to decide upon how much bandwidth you need since all plans include an unlimited amount. It’s worth noting that included in the price is the more advanced maintenance a website requires. Much of Squarespace’s SEO is built-in whereas WiX utilizes plugins and an SEO tool that points out where and what a user needs to include on their site to get found online. WiX is definitely challenging WordPress and Squarespace on this. Squarespace is fully managed so, they have a team of people who work solely on SEO. I’ll let you be the judge on this one ;). Ultimately, it comes down to your business needs. The online home of your business should support it. This means being able to fully function in the current environment - mobile-first, serving our audiences, and ease of use. Your website is an incredible ally in your business. For many of us, it is the place where you showcase your products or services, where you meet customers and clients, and the face as well as the personality of your brand. Leave a comment below and tell me what you’ve come up with in your own search.